In recent months, there has been a lot of suffering in the world due to hatred and fear. In times like these it is important to be reminded again and again of what true, selfless love looks like. Maybe, many of the acts of hatred in the world stem from a misunderstanding of true love. When people seek perfection in others, they inevitably become frustrated and angry because no one lives up their expectations. In despair, they assume the worst of everyone. Søren Kierkegaard (pronounced ‘Surn Kierkegore’) was born in Copenhagen, Denmark on May 5, 1813 (yes, last year was his 200th birthday), the son of the hosier Michael Pedersen Kierkegaard. Søren was the youngest of seven children, but five of his siblings passed away before reaching adulthood. Michael was a strict pietist; a “very stern man, to all appearances dry and prosaic, but under his ‘rustic cloak’ demeanor he concealed an active imagination which not even his great age could blunt.” There has been much speculation concerning the reason(s) for Michael’s temperament and the extent to which he influenced Søren’s personality and authorship. According to Søren’s journal entries, Michael spent his childhood as a shepherd on the moors of Jutland. His life was hard; he was constantly cold and hungry. One day, in a bout of desperation, Michael stood on a hill and cursed God. In later years, due to the death of his wife and children, Michael became convinced that God had cursed his whole family in punishment for his one great act of defiance. His father’s deathbed confessions caused Søren great anxiety. Michael wished for his sons to become pastors in the National Church. Søren obeyed his father, studied philosophy at the University of Copenhagen, and eventually was ordained. However, Kierkegaard felt called to a different vocation: writing. He suffered from anxiety and depression principally caused by a knowledge of his own sinfulness. Kierkegaard ultimately felt that he could not fulfill the duties required of a husband and broke up his engagement to a woman named Regine Olsen (pronounced ‘Regina Elsen’ with a hard ‘g’). The breakup was painful for both people because Søren loved his fiancée and Regine never learned the real reason for the breakup. 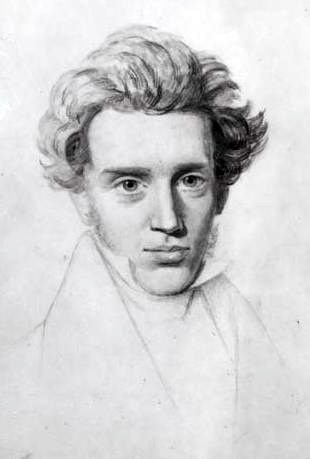 Although Kierkegaard was ordained in the Danish National Church (full name: Evangelical Lutheran Church of Denmark), he only preached two sermons in his whole life. A profound conversion experience along with an increasing dissatisfaction with the state of Christianity in the National Church prompted Kierkegaard to write a series of books under a variety of pseudonyms. In this so-called first authorship, Kierkegaard employed the Socratic dialectic. The pseudonymous authors of these works do not fully share Kierkegaard’s life views. In fact, it seems to me that Kierkegaard vehemently disagrees with some of the authors. Although he would be upset with me for blowing his cover, I think it is important for you to know that Kierkegaard is trying to deceive the reader into Christianity. In Denmark, where everyone was Christian from birth, Christianity had become nothing more than a label. It was merely a cultural and national identity. He felt that established Christianity (what he called “Christendom”) had “abolished Christianity”. He hoped that people, through his pseudonymous works, would start asking themselves the tough questions about self, life, truth, special revelation, and authority. In addition to his dislike of cultural Protestantism, Kierkegaard was very critical of Hegelianism. Hegel had placed faith as one stage in world history, but it wasn’t the highest stage. The Hegelian system had influenced the Danish theologians and pastors to the detriment of Christian truth. Kierkegaard’s second authorship was written under his own name and included a series of unspoken sermons which he refers to as “upbuilding discourses”. These are my favorite of Kierkegaard’s works. There is so much more that I could say about his books, but Kierkegaard writes for “that singular individual”. He doesn’t deny objective truth, but truth must become subjective (must be truth for me) otherwise knowing the truth is pointless. I plan on re-reading (or reading for the first time, as the case may be) all of his pseudonymous works this year. Some of his books are reasonably priced on Amazon. Others are quite expensive. Not everyone has access to a research library so I will propose a few lists to get you started. There is no correct reading order. Any order will do; however, always take into account the author. If it is a pseudonymous work remember that Kierkegaard may not completely agree with the author. That work may only explore one side of a debate. A work that doesn’t fit in either authorship is The Present Age: The Death of Rebellion. If you only read one work by Kierkegaard, read this one. It is very prescient. And finally, a note on the available translations. Walter Lowrie was instrumental in introducing Kierkegaard to the English-speaking world in the 1940s. Kierkegaard has influenced so many movements: the Neo-Orthodox and Liberal theological schools, Phenomenology, Christian existentialism, and (to a lesser degree) atheistic existentialism. Lowrie’s contribution to Kierkegaard scholarship is great, but his translations are clumsy and archaic. Kierkegaard is hard to read even in the original language. I don’t want to deceive you. His writing is repetitive and adjective-rich. You need patience, but like I said before, reading his works is rewarding. Many of Lowrie’s translations will make you pull your hair out so avoid him if you can. David and Lilian Swenson have translated many of Kierkegaard’s upbuilding discourses but almost all of them are out of print. They are a bit easier to read than Lowrie’s translations, so if you are forced to choose between Lowrie and the Swensons, take the Swensons. Walter Lowrie did work with David Swenson for years. Howard and Edna Hong are the greatest translators. Their translations include extensive endnotes as well as entries from Kierekegaard’s journals. They can be very expensive, but you can sometimes find relatively cheap used copies on Amazon. They are the best. Alastair Hannay has not translated most of Kierkegaard’s works, but his books are the least expensive. The translations are good although not as excellent as the Hongs’ translations. Last March he published a new translation of Concept of Anxiety. I haven’t read it yet though. This is an extremely long post, but I hope what I wrote is helpful. There is an amazing blog on Kierkegaard that you should reference when you have questions. The blogger made very thorough posts about each and every one of Kierkegaard’s works. Unfortunately, he passed away some years ago.